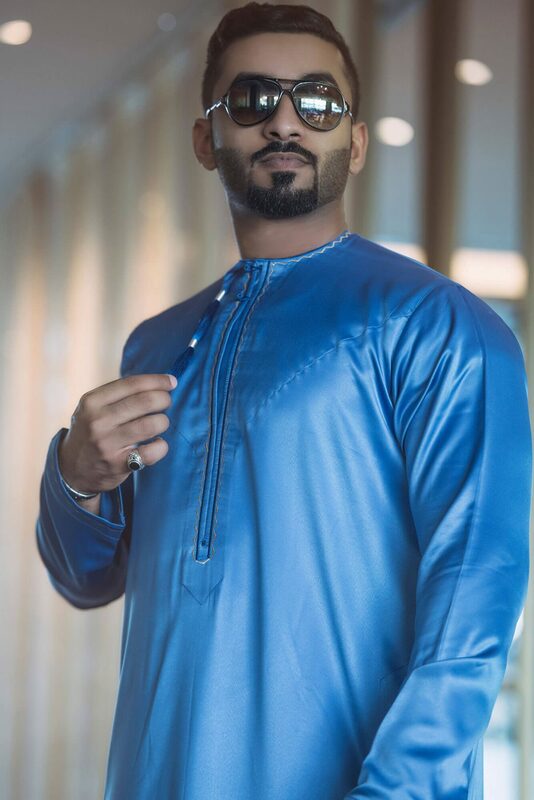 Update your traditional wardrobe with a bright pop of colour in a seriously luxe fabric with the Qubais men’s jubba from our new collection. Wrap the tape measure under your armpits, around the fullest part of your chest. The tape measure should be snug. Not so tight that it constricts breathing, but not so loose that the tape measure slides down. Don't puff out or flex your chest. Just stand normally. Update your traditional wardrobe with a bright pop of colour in a seriously luxe fabric with the Qubais men’s jubba from our new collection. Fitted and tapered for a modern fit, the neckline is cut high and rounded, finished with minimal silver embroidery edging and classic handmade buttons. Permeate the tassel in your favourite Oud for the perfect finishing touch. Make a strong sartorial statement in a black men’s thobe, crafted in an ultra-luxe fabric with a glossy sheen finish. Opt for pure white with a rich and luxurious deep red contrast trim with the men’s Sawda jubba, the perfect thobe to take you from day to night at any event or function. Crafted in luxuriously soft fabric for ultimate comfort all day, the Tihamah men’s thobe is the ideal neutral choice, in a palette of white and soft grey contrast trimmings. The Ismat men’s jubba in a luxurious pure white palette. Finished traditionally, you’ll find a pure white tassel, handmade buttons and white piped edging detailing to finish the men’s thobe in style.